My ebook “Dogging Steinbeck” would never have happened without the support, interest and divine intercession of my ideological soulmates and friends at Reason magazine. No book gave me more of a kick this year than Bill Steigerwald’s investigative travelogue Dogging Steinbeck. 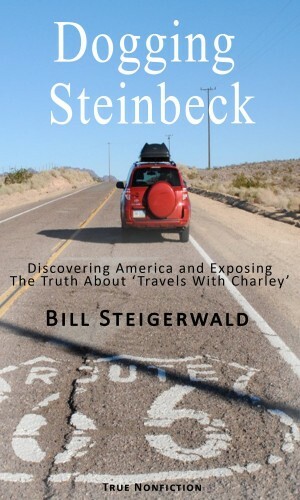 After getting a buyout from The Pittsburgh Tribune-Review in 2009, veteran journalist and Reason contributor Steigerwald decided to retrace the road trip that Nobel laureate John Steinbeck immortalized in his 1962 classic Travels with Charley. Steigerwald figured that at journey’s end, he’d have material for a book exploring how far we’ve come as a country since the Kennedy years. Instead, Steigerwald uncovered a massive literary fraud that speaks directly to contemporary controversies over ostensibly nonfiction narratives such as Greg Mortenson’s Three Cups of Tea, Jonah Lehrer’s Imagine, and Mike Daisey’s The Agony and the Ecstasy of Steve Jobs. The newsman found out that the Grapes of Wrath author either hugely exaggerated or just made up many of the encounters described in Charley. Steinbeck also misrepresented the actual conditions of the trip in ways that shouldn’t be tolerated in tomes whose authority derive from their facticity. Far from spending mostly solitary days with Charley the dog, Steinbeck was accompanied by his wife for almost half his time on the road. And far from roughing it, they spent a good chunk of time at high-end hotels or at places such as Adlai Stevenson’s Illinois mansion. Steigerwald’s slowly growing exasperation with Steinbeck’s dissembling is a joy to read, as is his incredulous reaction to Steinbeck scholars who wave away the esteemed author’s flagrant bullshitting. But best of all is the contemporary America that Steigerwald discovers. Where Steinbeck inveighed against comic books and processed food and crabbed that the nation had grown spiritually “flabby” and “immoral,” Steigerwald is positively Whitmanesque in his celebration of the country. Self-published as an ebook, Dogging Steinbeck also embodies a do-it-yourself culture that was just gearing up in a big way in the early 1960s. Worth more than the sales of my ebook “Dogging Steinbeck” are the nice, smart comments I’ve gotten from my fellow journalists and perceptive readers at Amazon.com — without having to bribe a single one. The great travel writer Paul Theroux, who doesn’t dig it when famous travel writers lie about their trips, hasn’t read the book. But he encouraged me to write it and has credited me for my findings of Steinbeck’s literary fraud. 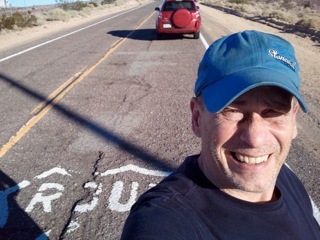 Curt Gentry, the author of a dozen books including “Helter Skelter: The True Story of the Manson Murders” (with Vincent Bugliosi), did read “Dogging Steinbeck.” He’s also a “character” in it — a mini-hero, actually. Not everyone will like my book, what I say about Steinbeck or his book, or what I say about America and what/who ails it. But whether “Dogging Steinbeck” is a bust-seller or a best-seller, comments like Theroux’s and Gentry’s are priceless. What did free-marketeer Larry O’Donnell tell the Prez? Yesterday the MSNBC all-stars — Rachel Maddow, the Rev. Al Sharpton and Lawrence O’Donnell — dropped into the White House’s West Wing to share their brilliant tax ideas with the President. Let’s hope that Mr. Obama listened to nothing said by Ms. Tedious or Rev. Al, who if he gets any smaller will be appearing in Pixar movies. But Larry O’Donnell, despite his nightly liberal rantings, could teach the Prez (and his liberal choirmates) a thing or two about the free enterprise system and why killing what’s left of it with higher taxes and more dumb regulations is a bad thing to do. In 2005 I asked O’Donnell, the executive producer of “West Wing” and a screenwriter, about all the fine free-market rhetoric he was putting into the mouth of Alan Alda’s conservative Republican character. “No, no, no. I’m a European socialist, believe me – I’m far to the left. But I understand. I’m a kind of practical socialist. I know we failed. A lot of our ideas have failed, so I’m not with them anymore. I’m willing to take from a grab-bag of stuff that works…. “Unfortunately, I think respect for the market seems to be something that I have not seen anyone derive outside education. I haven’t seen people gravitate toward a natural respect for the market. And it doesn’t have rhetoric to go with it. I think the rhetoric Vinick (Alda’s character) used about it was about the best I’ve heard…. The whole interview is here but don’t tell O’Donnell’s bosses at MSNBC what he really thinks about Nike sweatshops and oil companies, or he might have to try to get a job at Fox.